Aposimz Vol. 2 Review – AiPT! 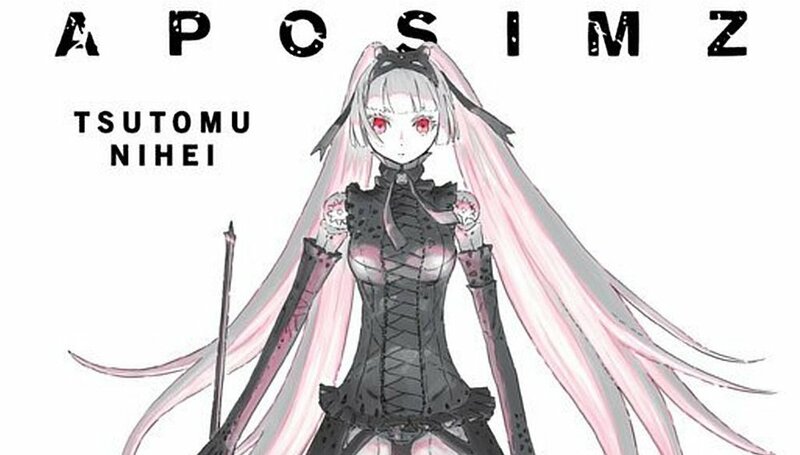 Out of all the new manga that debuted last year, Aposimz was among the most impressive. Tsutomu Nihei’s sci-fi action series, published by Vertical Comics, introduced its basic lore and concepts without relying on clunky exposition or rushed pacing. Rather, the series took its time (though it didn’t move too slowly) getting readers acquainted with its heroes Etherow and Titania. The manga’s unique stark aesthetic also impressed and proved a great match for the story’s desolate tone. Aposimz Vol. 2 is out now, and it continues the main duo’s adventures as well as introduces their new ally, Keisha. Does this second installment live up to the high expectations set by its predecessor? Is it good? Art-wise, this volume has all the same strengths Vol. 1 did. In fact, they’ve largely been heightened. The ultra thin line-work continues to work well on several fronts. It lends itself well to the action scenes, with the characters’ quick movements and attacks. The flow of motion across fights in this volume is near perfect; it reads like an extremely well-choreographed action movie. As a result, watching the characters throw down is exciting and the outcomes of these scenes never feel too certain. Nihei also does a great job of showing a lot with very little. There are shots of giant structures exploding that he renders with just a few lines while still conveying the events’ scope. He’s able to do this largely because of his strong skills with perspective. The page and panel compositions are excellently done as well. Nihei knows how to time splash pages effectively, and without spoiling anything I’ll just say that there are a number of “oh s--t” moments throughout. The art’s soft aesthetic conveys the fragility of the characters’ lives and the world around them. Nothing and no one feels invincible. The shading throughout is also lovely. Nihei exclusively uses whites and light to medium grays which give the book a sparse look that never pivots into being overly dark. There’s a subtlety to the way the lighting is handled, as just the right spots are illuminated to convey the proper light sources. The character designs are also well-done. They’re not overly cluttered with unnecessary lines but they’re still distinct enough that there are almost never any visual clarity issues. Keisha’s debut in particular is made all the cooler by how awesome her armored form is. It has a sort of fencer-esque look to it that sets it apart from other characters’ more traditional sci-fi armors. They look great too, they’re just not quite as distinctive. Fortunately, this volume’s writing matches the quality of its visuals. The pacing is fantastic, as Nihei never lingers too long or too briefly on any plot point. Transitional scenes extend just long enough to provide whatever cultural context helps enhance the reader’s understanding of the series’ various locales. The characters’ personalities are also conveyed effectively through the dialogue, so even when they don’t do much introspection it’s still easy to get a feel for who they are. My main qualm with the writing is just how it’s displayed at times. There are a few points where captions’ contents change between different characters’ thoughts, but there’s no clear visual indicator for when the speakers change. Besides this, my only issue is with the villains not having much unique flair as of yet. Hopefully they’ll get more fleshed out in future installments. Overall, Aposimz Vol. 2 is a great followup to a great debut. All of the first volume’s strengths are still present and they’ve been further heightened. The visuals impress on virtually all levels, and the pacing throughout is superb. My only qualms with the book are relatively minor and don’t arise very frequently. Aposimz is one of the best science-fiction comics being published today. Overall, Aposimz Vol. 2 is a great followup to a great debut. All of the first volume's strengths are still present and they've been further heightened. The visuals impress on virtually all levels, and the pacing throughout is superb.